Play Rainbow Riches Pick N Mix with 500 Free Spins! Rainbow Riches Pick N Mix is a sequel to the original with the added feature of players being able to choose from 5 Bonus features. This online slot has a 96% RTP with 5 reels and 3 rows by the developer Barcrest. Find your 4 leaf clovers and feel the luck of the Irish in Rainbow Riches Pick N Mix online video slot, where you choose your bonus for many chances to win real money in a pot of gold at the end of the rainbow. 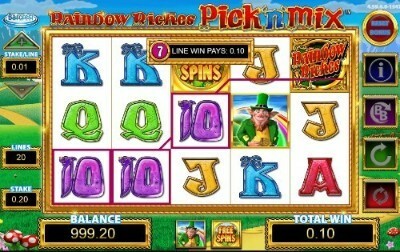 Rainbow Riches Pick N Mix slot has fun gameplay that’s as easy as saying 1, 2, ‘tree’ in an Irish accent. With 5 reels, 3 wager rows, and 20 paylines, you may be dancing an Irish jig with excitement. Before you spin the slots, you get a chance to choose up to 3 of 5 Bonus/Scatter symbols. If you select just 1, you will see that Bonus appear more often on the reels. With the exception of the Free Spins symbol, 5 of the other Scatters will award the highest prize of a 500x multiplier. The Wild replaces all other symbols, except the Scatters, to complete wins. Rainbow Riches Pick N Mix online slot has a very flexible betting range from 20p to £500. There is also a Big Bet Game whereby you can bet from £10 to £25 and spin a wheel. The bigger the bet, the larger the rainbow slice of the wheel appears which triggers the Bonus when landed on. If the arrow points on the green, you’ll receive 5 mega spins. Every win in the Free Spins Bonus and Mega Spins receives a 3x multiplier while during the bonus this is boosted to a 60x multiplier. You can even play Rainbow Riches Pick N Mix online while on the craic as it is beautifully designed as a mobile slot as well as on tablet and desktop. With many different bonuses and high value symbols, the theoretical RTP is set at 96% and 98% during the Big Bet Game. Rainbow Riches Pick N Mix slot is exciting and unique in that you get to choose up to 3 of 5 Bonuses that you’d like to see appear on the reels. If you select only 1 Bonus, you will win it more often. At least 3 of the symbols trigger the Bonus. Road to Riches involves spinning a wheel to determine the number of steps needed on the cash road to multiply up to 500x your total wager. In Cash Crop, a screen appears of 50 spinning coins which advance to higher multiplier (this depends on after each reveal, a final spinning coin says ‘collect’ or ‘go on’). The Magic Toadstool Bonus lets you pick 3 of 24 toadstools to reveal a prize or a faerie that awards another 3 selections. You can win up to 500x your total bet. In Pots of Gold you can also win up to a 500x multiplier as pots of gold, silver, and bronze spin and award prizes. The Free Spins Bonus awards, as the name implies, Free Spins with 5 on the reels activating 30 Spins. If 3 or more Free Spins symbols appear, the Round is retriggered which creates even greater chances for large payouts. The developers at Barcrest must have been drinking lots of Irish coffee into the wee hours of night for inspiration in creating the innovative Rainbow Riches Pick N Mix online. Celebrating 50 years, Barcrest is easily considered a pioneer in casino gaming and has evolved with each decade to impress players of online casino UK. They are known for their immersive visual, exciting and unique gameplay, and many chances to win real money in their bonuses. RoseSlots.com offers their titles to enjoy, including their affiliated Scientific Games slots, such as the original ‘Rainbow Riches UK slot’, and WMS SG’s ‘Monopoly Bring The House Down slot game’. If you were charmed by the Irish, you can also play the fun ‘Lucky Leprechaun’ at Rose Slots. Barcrest presents a sequel to one of the best-loved slot games of all time; a 5x3 layout Irish themed online slot full of colourful characters from Irish folklore, with 30 paylines and an RTP of 94 to 98%, dependent on the value of your stake. An impressive six bonus features are available to players, with a maximum 500x jackpot. Many of you will need no introduction at all to the Rainbow Riches family of slot games; it’s one of the most popular franchises in the history of online slots, and it has a wide and varied fan base. If you already know and love the original game, but are new to this sequel, we think you’ll like the sound of the new features we’re about to tell you about. If you’ve never come across Rainbow Riches games before, you’re in for a real treat! First, let us give you a little background. The Rainbow Riches games, including this ‘Pick N Mix’ sequel, are all based on Irish legends and myths. They take a colourful, frivolous and fun approach to their subject matter. It’s almost impossible to play a Rainbow Riches slot without a smile on your face! The scenery and the characters are all slightly cartoonish in nature and take inspiration from the stereotypes that exist around Ireland. That means you can expect to see pots of gold, leprechauns, rainbows, harps and all the rest! The ‘rainbow’ in ‘Rainbow Riches; referred to the rainbow that appeared over the reels in the original slot game. There isn’t any rainbow this time around, but there’s no mistaking the lush green hills and fields of the Emerald Isle in the background. Instead, the designers seem to have taken a few cues from ‘The Wizard of Oz’, with a yellow brick road cutting all the way through the fields, leading to an unknown land. It may seem like a strange stylistic choice, but it will all make sense when we look at the bonus rounds in a moment. Although the base game is perfectly functional and fun to play, Rainbow Riches Pick N Mix was designed for one reason and one reason only; to bring players a wide and an exciting number of bonus features. Because there are so many bonus features, there are comparatively few regular symbols on the reels. The traditional playing card symbols 10, J, K, Q and A are all present and correct, but the only ‘regular’ symbol above that is a big shiny gold coin, which is the game’s wild. It will replace any other symbol to create a winning line - with the exception of the bonus symbols. The type of bonus symbol you’ll see depends on which bonus modes you choose to play with before you even spin the reels for the first time. Many online slots have a ‘prize picker’ bonus feature, and you may have thought that was where this game gets its name from. It isn’t. Unusually, this online slot actually lets you decide for yourself which bonuses you’d like to have in play. In a way, it’s a bit like building a slot game yourself, to your own preferences! There are a few to choose from, so let’s see what this slot has to offer. A word of warning: Not everybody loves to have too many bonus features available. Some players love them, and some players hate them. Most slot games only offer one or two for that exact reason; they’re trying to strike a balance between the two types of preference. If you don’t like games that are all about the bonus rounds, Rainbow Riches Pick N Mix isn’t for you. The good news is that the original Rainbow Riches is much more straightforward, so if you like the sound of the theme, go and give that a try instead! Before you’re allowed to take your first spin of the reels in Rainbow Riches Pick N Mix, the game will offer you a choice of any three of the five bonuses it has to offer. Each bonus is represented by a different symbol; a ‘free spins’ symbol (no prizes for guessing what that does), a toadstool, a leprechaun, a pot of gold, and a leprechaun head. It should be noted that you don’t have to pick three; you could choose to play with only one if you so wished, and that would boost your chances of triggering that specific bonus. You’re not stuck with your selection for the whole time you’re playing; you can edit them at any time between spins by using the ‘reset bonus’ button. The trigger for all of the bonuses is the same; they all function as scatters, and they all start their respective rounds when you land three or more of them anywhere on the reels. If you’re lucky enough to conjure five of them at once, you receive an instant jackpot of 500x your line bet..unless it’s the free spins symbol. That just gives you even more free spins. Choose the leprechaun head symbol, and you have access to the ‘Road to Riches’ bonus feature. This is a bonus that comes straight from the original game. Land three or more of the leprechaun head symbols, and you’ll be taken to a new game screen and invited to spin a wheel of fortune. All the prizes the board numbers. Whenever you land on a number, your leprechaun mascot will take a few more paces up the yellow brick road (we told you that would come back! ), picking up multipliers as he goes. When you land on ‘collect’, the game is over. Choosing the pot of gold as a scatter means you can play for the appropriately-named Pots of Gold bonus feature. Again, three or more of the symbols trigger the round, which is a prize picker. Select one of the pots of gold on offer to you, and it will reveal an instant cash prize. It could be large or small, so wish yourself luck when making your selection! You already know what choosing the Free Spins scatter will do; give you the chance to spin the reels without paying anything out of your pot in order to do so. The scatter operates a little differently with free spins; you have to land on reels one, three and five in order for the round to trigger, and any number of three or more of the scatters will get you started. You get ten free spins for three symbols, twenty for four and thirty for five. Don’t worry if you start off low though; this round can re-trigger if you find more free spins symbol as it goes on. To make the round even better, the free spins logo stacks up on the first reel throughout the free spins, acting as an additional wild. Choose the leprechaun, and you have potential access to Cash Crop mode. This is another one of the bonuses which takes you to a new game screen. In this case, you’ll be confronted by fifty spinning gold coins in a field. Each of them contains either a multiplier or a cash prize. All of them are added up and awarded to you, and then you can either accept them and play on or take a 50/50 gamble to double up on your winnings by playing the round again. If you win the gamble, the round repeats. If you lose, the round is over. If your luck is in, you can repeat this round a maximum of three times. Each time you do the cash prizes and multipliers are more valuable. The toadstool symbol is magic, as it turns, out, and provides access to the Magic Toadstool round. Once more, you’ll need three or more symbols on your reels to start the bonus, and it involves yet another play screen. As with Cash Crop, this bonus takes place in a field, but this time it’s full of mushrooms instead of coins. There are 24 mushrooms in total. You may choose only three of them. Some of them hide multipliers, and some of them will dissolve to reveal a magical fairy. The fairy will allow you to make an additional three selections each time you find her, so she has the potential to keep the multipliers coming! That might sound like a lot of bonus rounds, and to be honest, it is. The game still has one more up its sleeve though. As is common with a number of Barcrest slot games, you may choose to take a Big Bet if you wish to do so. The big bet is really just a shortcut mode; in return for paying a price, you may attempt to trigger any of the bonus modes immediately. You’re taken to a screen showing three mini wheels of fortune, each one representing one of the bonus games. Choose which one you want to spin, and try your luck. If the needle lands in the rainbow section, the round commences. If it doesn’t, then too bad; you lost the bet. That’s how gambling works! If you’re playing with a particularly large disposable budget, you can even pay a little more to make the rainbow section bigger. The highest RTP rate that Rainbow Riches Pick N Mix offers is actually tied to Big Bet mode; when you’re playing it, the RTP jumps up to 98% because you’re more likely to enter a bonus feature and win. Barcrest is a name with a long history of making slot games, but they no longer actually exist as a company in their own right. They’re currently the property of SG Gaming, who bought them out and kept them active as an in-house developer. SG Gaming is aware of the name value of their acquisition, and so it’s still used when new slot games are released from the Barcrest team within the company. It’s been more than fifty years since Barcrest was founded; they were first registered as a company in 1968. In a little over a decade, they became one of the largest slot game creators anywhere in Europe. Back then, slot games came in physical cabinets, and if you wanted to send them elsewhere in Europe, you had to ship them overseas! Casinos and bars were Barcrest’s biggest customers, and business continued to boom for the company for decades, right the way up to the dawn of the internet age. The internet changed everything, and companies in the slot game trade either adapted or fell away. Barcrest changed with the times and saw the potential of the new web-based medium for their games. They thrived online, and in 2006 they launched the original Rainbow Riches, which was a bigger success than even they could have imagined. It remains the game that the company is best known for, even so many years later. The experience and skill of the company - as well as the highly desirable property of Rainbow Riches - caught the eye of Scientific Games, who completed their takeover of Barcrest in 2011. They effectively combined Barcrest with The Global Draw, another acquired firm, and re-branded themselves as SG Gaming. In that latest guise, SG Gaming is now a massive company, with more than 500 staff, and desirable offices in London and Manchester. As well as designing and releasing new online slots, they also still create physical gaming cabinets and ship them to casinos, just as Barcrest did all those years ago! As they make both software and hardware, they consider themselves to be a company that offers a complete gaming solution to both players and providers. ”This exciting follow-up to our smash hit Rainbow Riches franchise is for new and old fans of Rainbow Riches alike! In Rainbow Riches Pick'n'Mix, you're in control once you trigger the feature round. Select from available bonuses you'd like to play from other versions of the beloved slot title, including the Free Spins Round, Magic Mushroom picking game, Pots O' Gold, Road to Riches, and Fields of Gold!" There are a lot of exclamation points within that text, but it’s easy to see why they’re so happy about the game; the Rainbow Riches series has been a license to print money for Barcrest and SG Gaming, and it’s likely to continue making it for a long time to come. Well, where would you like to start? As we’ve said already, there are several games in the Rainbow Riches series. It goes beyond mere sequels; there’s a family of linked games, all connected to the 2006 original. Let’s introduce you to them all! Rainbow Riches: The original, and the father of the family. Most online slots come with a shelf life; even the good ones. They’re released, they’re loved and played for a while, and then something newer and more exciting comes along, and they’re forgotten. That just hasn’t happened to Rainbow Riches. That’s probably because as well as being cute and playful, it was way ahead of its era in terms of what it offered players as bonus features. The ‘Road to Riches’ feature, which is still present in the latest Rainbow Riches games and still feels fresh, can be traced all the way back to the original! This timeless, classic, legendary slot game has 20 paylines and an RTP of 95%. Rainbow Riches Reels of Gold: This game, released in 2016, wins the title for having the longest name in the Rainbow Riches series. This is a hugely expanded sequel to the original, and when we say expanded, we mean it literally. There are ten reels on the screen at any one time, meaning there’s a lot to keep an eye on. Because there are so many reels, you also get 100 paylines to look out for. If that still isn’t enough for you, there’s eight different bonus features, and a magic fairy who appears at random and changes the symbols on the reels. In short, there’s a lot going on. For some people it might be too much, but if you love quirks and extras, you’ll be right at home with Rainbow Riches Reels of Gold. RTP is between 94% and 98% for the exact same reason it is in Rainbow Riches Pick N Mix; the Big Bet feature. Rainbow Riches Free Spins: If Pick N Mix, and the game above, sound too complicated for you, then Rainbow Riches Free Spins takes everything back to basics. Released in 2017, this game has one bonus feature and one bonus feature only, and you don’t need us to tell you what it is. When you build a whole game around free spins, you have to deliver on it, and the developer does. It’s possible to re-trigger free spins rounds again and again in this game, all the way up to 999 spins! There may only be ten paylines, but the game makes up for that by working with a reduced number of symbols, meaning the paylines crop up more often. Rainbow Riches Fortune Favours: Another more recent entry in the Rainbow Riches family; this one was released in 2018. Instead of loading the game full of modern features, SG Gaming took a different approach; Pick N Mix and Slots of Gold are packed full of features, so Fortune Favours takes a different approach. In fact, this game is much closer to the original 2006 game, with modern graphics applied to it, and a few extra features. The Big Bet bonus from the more recent games is included, as is the magic fairy who first appeared in Slots of Gold. The maximum payout available is actually higher here than it is in Pick N Mix, but it’s up to you to decide whether that’s a worthwhile trade-off to play a more basic game. Rainbow Riches Drops of Gold: As the years go by, more and more Rainbow Riches games are being released. This is yet another one that was released in the past couple of years, specifically 2018. It’s another unique take on the format. At first glance, it operates on a standard 5x3 layout of reels and rows, but you’ll soon notice that the rainbow above the reels is full of pots of gold, all of which are spinning through it. When you land a pot of gold symbol on the 5th reel in the base game, the rainbow opens up and drops its contents onto your reels, appearing as additional wild pots of gold everywhere they land. In most cases, that should mean instant wins. The Big Bet is still here too, just as it is in almost all of the more recent Rainbow Riches titles. If you like your games quirky, you’ll probably love this. Rainbow Riches Home Sweet Home: The latest release in the Rainbow Riches series is still blinking in the sunlight; it was born at the very end of 2018. A huge 5x5 layout of reels and rows offers players 50 winning lines, and the game borrows a little from Drops of Gold for its main bonus feature. There are doors full of wilds above the reels; land a leprechaun symbol on the first reel and he’ll climb out, head on up to the doors and open them up for you, cascading the wilds onto your reels for instant wins. The Big Bet is here - as you’d probably guessed by now - but the RTP peaks at 97.75% rather than the usual 98% you get when it’s involved. As we’ve already noted, Rainbow Riches Pick N Mix was released a few years back in 2016. That’s recent enough for mobile gaming to have been popular and widespread, and so you would expect that mobile players were taken into consideration when the game was designed. So were they? Yes, they were. Everything works fine, but it could have been done a little better. So long as you tilt your phone or smart device onto its side, Rainbow Riches Pick N Mix plays perfectly. The graphics stay just as pretty, the sounds are just as clear, and the game is just as easy to play. Apart from the fact you’re playing on a smaller screen, and using your finger, there’s no difference in the playing experience at all. What isn’t so great is that you can’t play the game at all with your phone the right way up. The way the game has been adapted means that you’re forced to tilt your device, or the game won’t start. Obviously, we don’t mind turning our phones around, but it’s never nice to be forced to do anything. Other developers don’t push their players into doing this, and so we have to mark SG Gaming down slightly because they do. There are a lot of Rainbow Riches games, as we’ve just covered. Not only that, but many of them have been released in the past 2-3 years. That means they’re all competing for the same column inches in both the mainstream and industry press and not all of them can win that competition. Also, when writers do discuss Rainbow Riches, they tend to talk about the series as a whole instead of any individual game within it. That doesn’t mean nobody is paying any attention at all, though. Casinopedia which is a website covering the latest news and reviews within the online casino world recently looked into the way that women engage with online slots, and the games they prefer. Interestingly, the Pick N Mix version of Rainbow Riches is currently the second most popular of all the slot games out there with women. Is it the bonus features? Is it the characters? Is it just that it’s a great game? Who knows, but it’s a fact, so let’s embrace it!